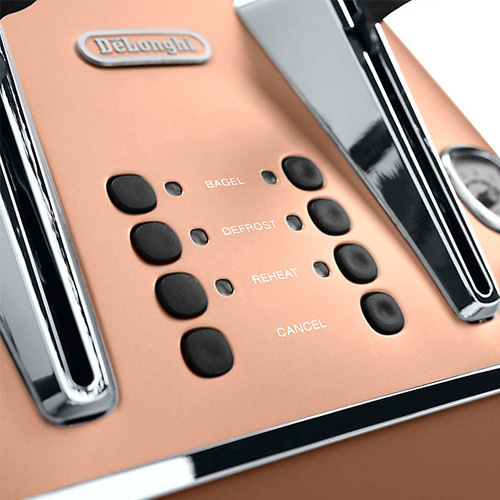 The iconic look of the Distinta range from Delonghi will add style and sophistication to any kitchen environment, in a range of colours the Distinta range of kitchen appliances all feature a metallic matt finish with chromed detailing for a truly exquisite look. 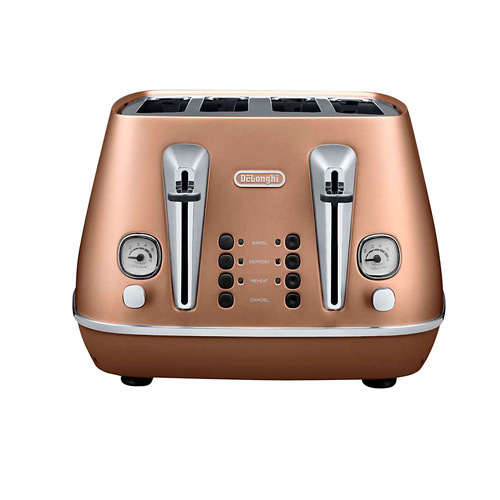 The 1800 Watt Copper 4 slice toaster from Distinta by Delonghi features 6 fully variable browning settings in addition to a bagel, reheat and defrost setting. 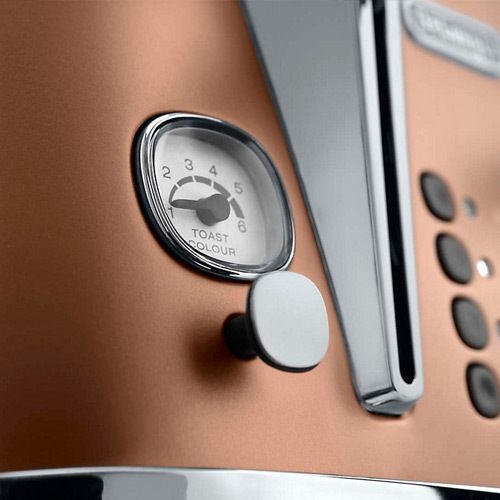 You can get your toast just the way you like it with the 6 levels of progressive electronic browning control that control the colour and texture of the toast to perfection. The reheat function is perfect for if you are interrupted leaving your toast to go cold as you can quickly reheat your toast with a touch of a button without the worry of burning it. The defrost setting allows you to perfectly toast bread and items that have come straight out of the fridge easily and efficiently. For saving energy each of the pairs of slots can be used independently of each other meaning you don’t have to waste electricity if you just want a quick snack and the high lift function allows you to remove smaller objects from the toaster leaving you less chance of burning your fingers. 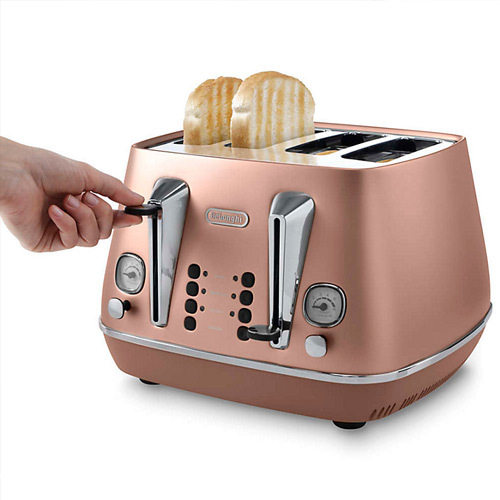 Other features of this stylish copper toaster include neon light indicators allowing the user to easily see what settings are selected as well as dual removable crumb trays making cleaning of the toaster incredibly hassle free. 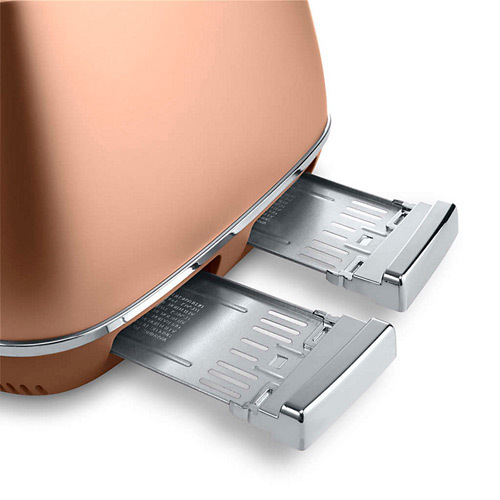 The toaster will also remain in place thanks to its non slip feet. There is a matching kettle available for this toaster, you can view it on visiting the retailer or in our kettle area.